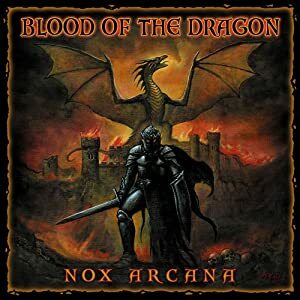 On Blood of the Dragon Nox Arcana attempts to go for a more typical fantasy theme. I think in some ways this might be seen as their version of Midnight Syndicate’s Dungeons and Dragons Official Roleplaying Soundtrack. Of course it wouldn’t be Nox Arcana if they didn’t include at least some of the darker/horror elements such as the “Underworld” and “Legions of Darkness”. “Citidel of Secrets” is a good track for any holy or magic temple/tower/building. A bell keeping ringing and a chorus of holy chanting takes the melody. Simple, but effective. “Mystic’s Keep” is pretty good, wit the upbeat feel and the tambourine it has a bit of a gypsy feel to it. I also like “The Seige”. It sounds like how you would imagine a song of that title. “Flame Tongue” is a roaring fire breathing dragon sound fx track that sounds like it might have been from Jurassic Park (I know it’s not really, I’m just making a comparison). “Highland Storm” has what sounds like bagpipes (probably MIDI sampled bagpipes) which gives the track a Scottish feel.